The complete portal for Geeks! The internet can be a great place and the longer we go on, the more of our time is spent on the internet, either for fun, shopping or work. Now we have many privacy issues with personal information being stolen. So now, we have to be more careful in the way we use the internet. The good news is, there are many browser extensions we can use to help us stay protected from hackers while we are online. 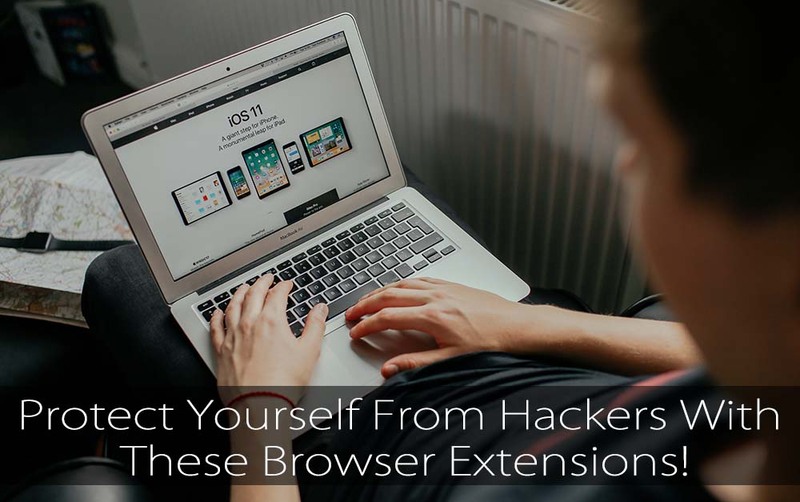 The most modern browsers do a great job in keeping many threats away, yet we can go that extra little step and add in some hacker busting extensions. There are numerous password managers available, yet the Last Pass is one of the crowd’s favorites. This extension like many others helps to make sure your passwords are a little more protected and secure, not to mention easier to handle. LastPass is so good; some people now use it for storing their credit card numbers. With regular passwords, we tend to think of things we can remember. LastPass has a built-in secure password generator that creates random passwords as a further element of protection. One of the best ways to protect your privacy online is the inclusion of a VPN. Although there are many paid for options, TunnelBear is one of the best free VPN services that you will find available for Chrome. These VPN services are a great tool to use when you are using public WI-FI which is where many problems originate from. TunnelBear sets up quickly and only requires a few mouse clicks to get your browser more secure. There are a lot of websites that pose all kinds of threats and problems. These can be security related or issues that are related to website performance among others. Once this has been installed, it takes little technical knowledge t get it up and running. ScriptBlock also comes with an option to whitelist websites and includes granular controls. All the sites you wish to visit can be whitelisted. This will prevent them from being affected by the extension. You are now in a position to see what websites are up to, so you have full control to prevent or allow the sites that you wish. For some users, it might seem a little complicated, yet making sure you fully understand it; you will find you can eliminate quite a bit of content from your surfing sessions. This ad-blocker has now become one of the favored ad-blockers available. uBlock Origin has one purpose in life, and that is to prevent websites and companies obtaining too much information about you from your surfing sessions. It can do this by blocking code that runs in the background and monitors your online activity or even worse. You also have the option to choose which sites or which ads you wish to keep on the sites you visit on a regular basis. As good a job as these extensions do, they might not protect you 100%. Hackers are pretty smart and find their ways around quite a few things. That being said, these five extensions or variants of these where applicable make it much more for hackers to get into your system. With a couple of them combined, it might be enough to thwart off an attack or make the hackers give up and look somewhere else. There are a few other things you can do as a precaution to help keep hackers out of your system. Uninstall unneeded plugins. You might have a secure browser, yet when you install software they do in some cases install plugins. These bits of software might not be as holy as they first appear. You can be protected from the outside, yet the inside is just as important. While you are installing any of these extensions to your browser, you can take the opportunity to uninstall any that don’t offer you any benefit in your browsing experience. Second to this. Any extensions which are enabled will use some of your computer resources, and by removing these you can make your browser a little more responsive, and it will use less system memory in the process.